World 4-4 is the Ghost House course of World 4 in Super Mario 3D Land. Mario stands in a corridor, with a Boo, that conducts the player to a invisible platforms path with another Boo, and in the end, a P Switch. The player will see a yellow moving platform in the right side, then they must jump in. It leads to a small invisible platform with a teleporting block. Entering in this block, Mario will be warped to another invisible platform path, now longer and with Peepas, two Boos and three blocks, including a ! Block that makes a four-block ground. In the end, Mario will find a octagonal room with the level's Checkpoint Flag and five blocks, one containing a Super Star. When Mario go toward the blocks, four Boos and a Tail Boo will attack him. In the right behind corner, the hero will discover more platforms with more ghosts and a Warp Box to warp him to another invisible way, more complicated and with a Big Boo. After, three moving platforms connects the lifts to a hall with two Brick Blocks (containing a coin and a Star) and a exit door. In the grassy area out of the house, Mario will find a Coin. Jumping towards it will make a platform (the same seen through the level) appear. More of them will able Mario to grab the top of the Goal Pole. Star Medal 1: This Star Medal is floating between two Peepas from the only group in the level. 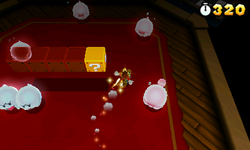 Star Medal 2: In the octagonal room, Mario must go to the first right corner. There are some invisible platforms and a wooden pipe. Destroying it will reveal a real Warp Pipe that warps Mario to an optical illusion room with the Star Medal. Star Medal 3: In the invisible path after the second teleporting box, Mario will see the Star Medal near the landing area. 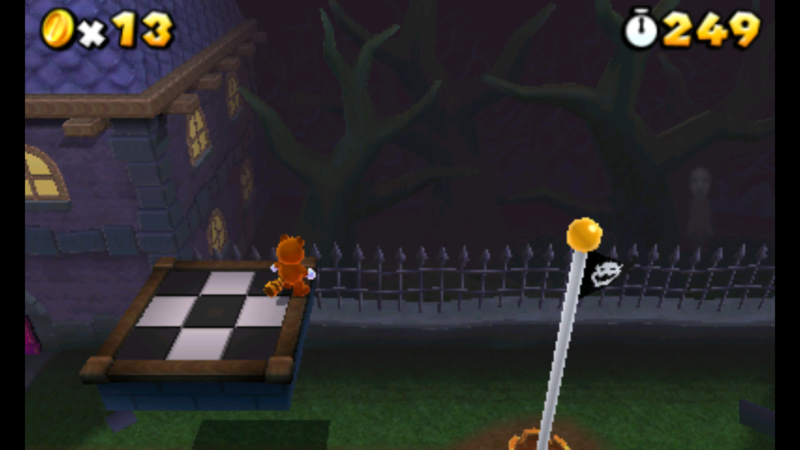 If the player stands on the short wall behind the Flagpole facing the fence and waits for a number of seconds, a ghostly figure will appear slowly out of the background. Once enough time passes, it will unexpectedly open its mouth wide and flash, while fading out at the same time. The spirit closely resembles the Tree figures in Shiverburn Galaxy, another easter egg that appears in Super Mario Galaxy 2. The music played in this level (and all subsequent Ghost Houses in Super Mario 3D Land) is a remix of the music that plays inside the mansion in the Ghostly Galaxy from Super Mario Galaxy. This page was last edited on April 5, 2019, at 18:13.